It had been a rainy night and I hadn’t slept very well. I decided to wait for a break in the weather until I packed up and got on my way. 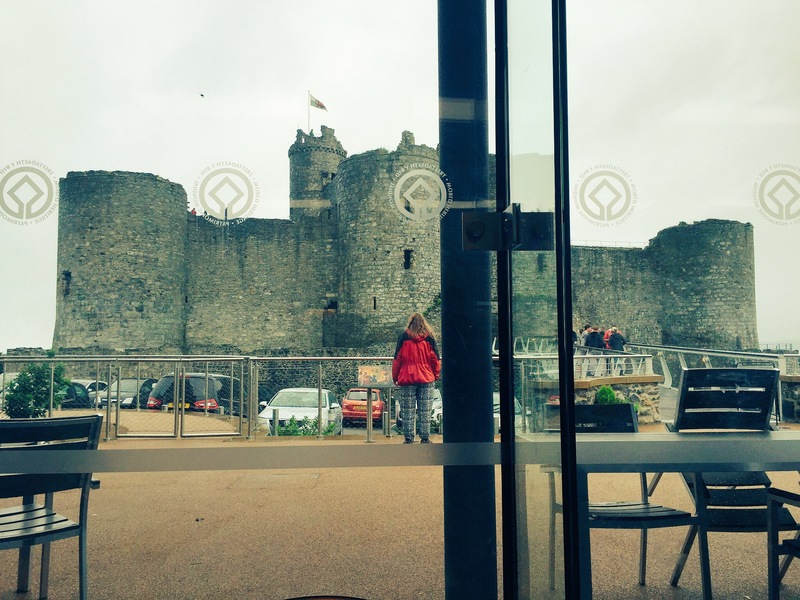 Eventually it came but it was late morning when I started walking towards Harlech Castle. Thank you to Eirlys at Tanforhesgan for making me so welcome and for the wonderful facilities in camp. 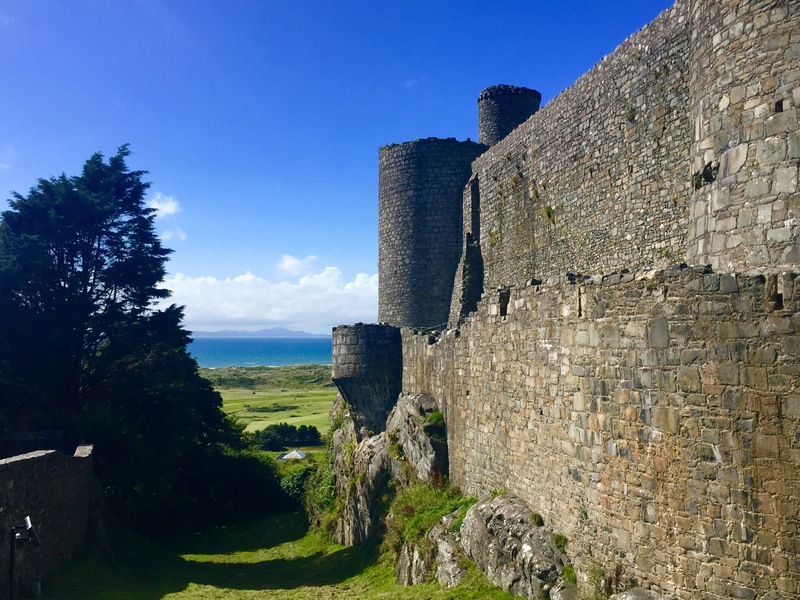 It didn’t take long for me to walk to Harlech. I needed to find somewhere to eat and update my blog. 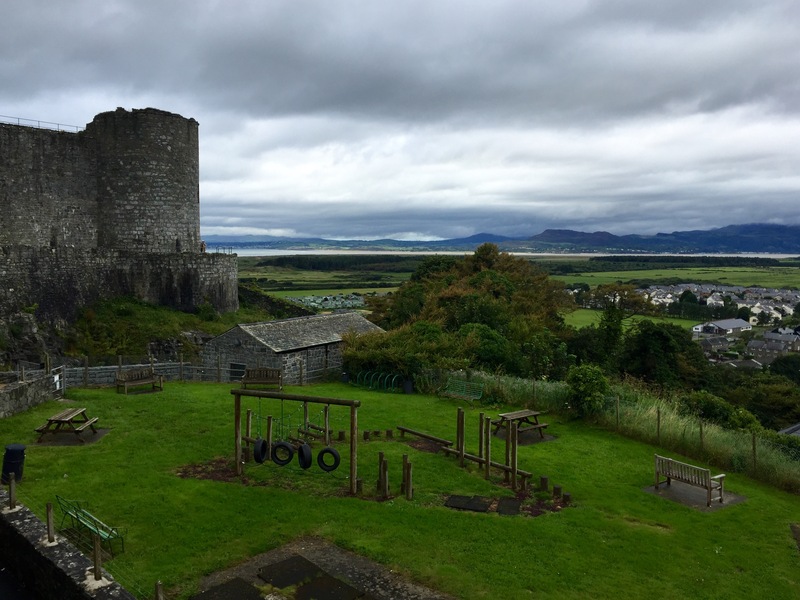 I saw the sign and started towards Harlech Castle. I hadn’t banked on there being the most grotesque hill to get to it though. A few steps in I almost turned around to find somewhere else, but hey, in for a penny, in for a pound, so I continued. Ruddy-faced and windswept, I finally arrived at the castle, desperate for food and water. So that’s where I sat, wrote, drank and ate. This was my view. Not bad eh? Did I go in to the actual castle? No. But it has been added to my ‘to do’ list. It’s an excuse to return for one thing. The excellent cakes are another excuse. By the time I was ready to leave, the rain clouds had cleared to reveal a blue sky. I took that as my cue to start walking again so I made the somewhat easier descent to the sea front in order to rejoin the Wales Coast Path. 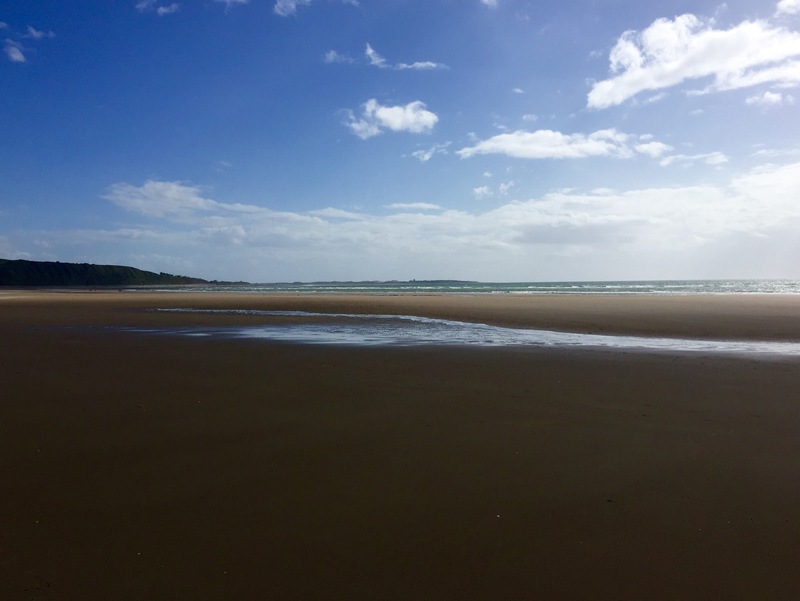 Ahead of me lay a vast expanse of sandy beach with the tide right out. The rain had cleared but the breeze was insane. 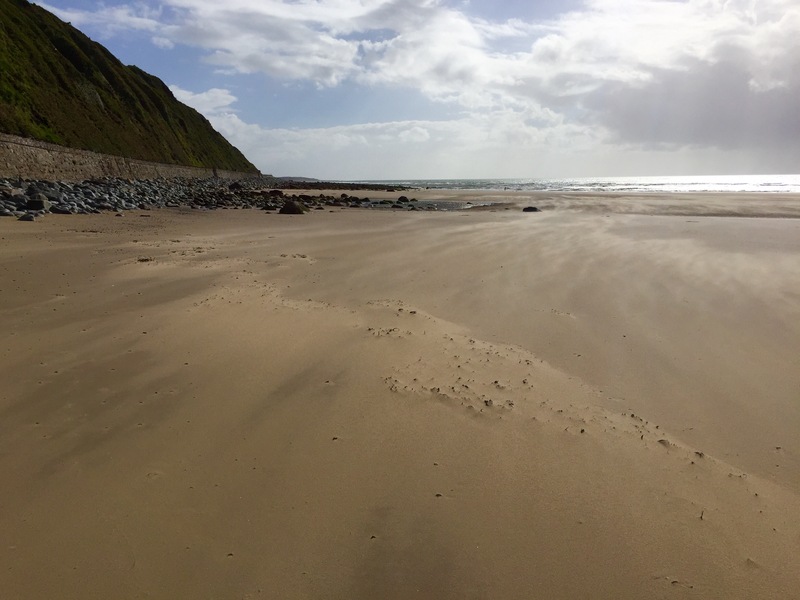 Loose sand snaked across the beach, whipped up by the wind. After a couple of kilometres, I was led away from the coast and uphill in order to avoid the headland. I walked along roads and through fields for what felt like ages. 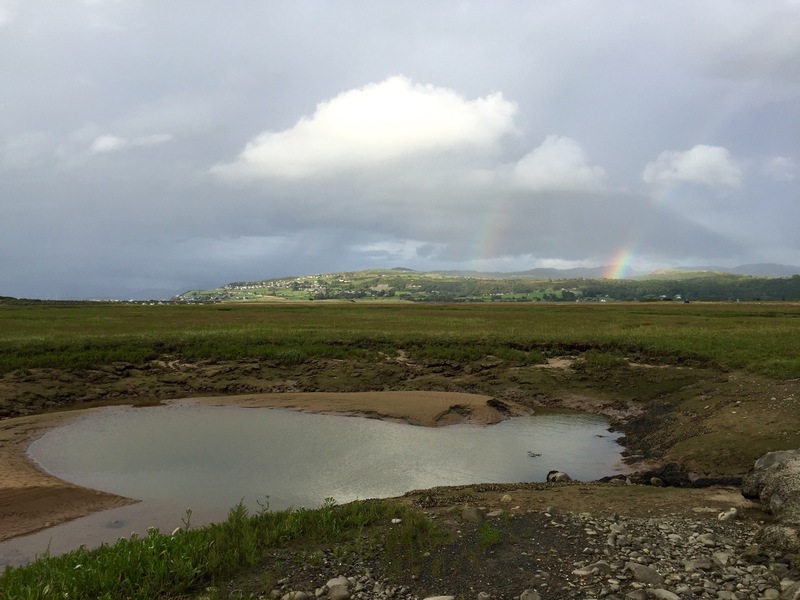 I went past the former RAF base at Llanbedr and crossed the railway line several times too. The weather by now was confused, throwing bright sunlight at me as well as winds and showers. It resulted in a rainbow, not terribly well captured by my iPhone. But you get the gist. 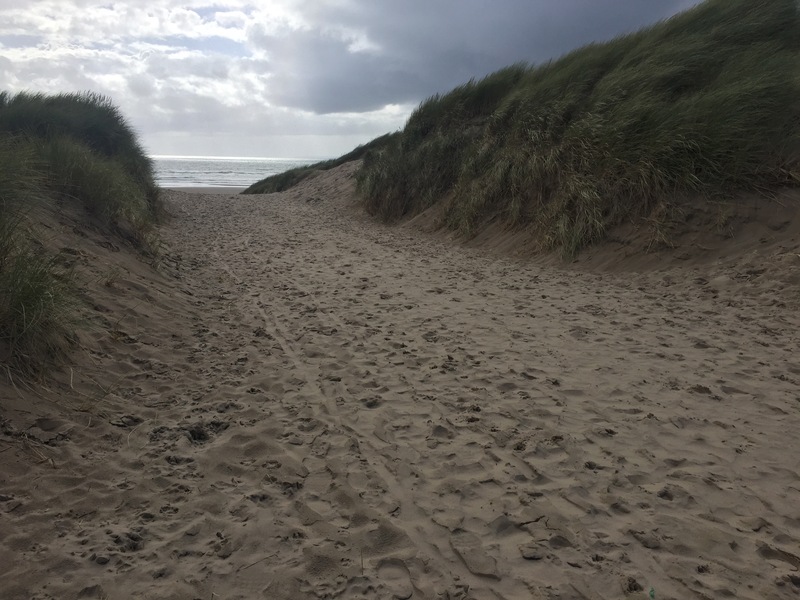 Eventually I got back to a sandy beach at Morfa Dyffryn and started walking south. There’s a naturist area here but I didn’t see anyone in clothes let alone naked. Daydreaming, I ambled down the beach. I was tired by this point and couldn’t wait to get to sleep.